Once per turn, Dong Cheng can discard X hand cards. He then chooses X people and they all draw a card. If X is two or more, Dong Cheng recovers one health. After his drawing phase, Dong Cheng can put three cards on the table. These are called Imperial Jades. After his next drawing phase, he returns these cards to his hand. 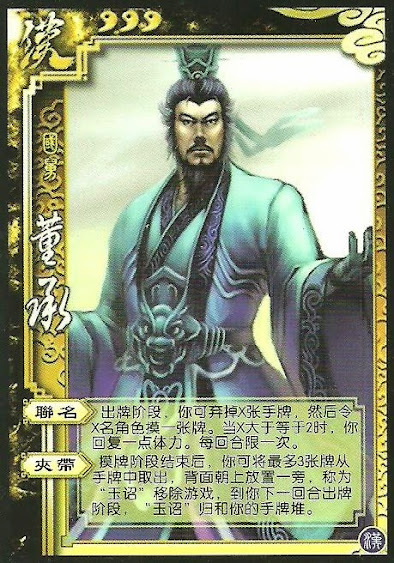 "Unite" works in a similar manner as Liu Bei's "Kindness", but new cards are drawn instead. When Dong Cheng uses "Secret Compartment", he recovers the previous turn's Imperial Jades before he chooses new ones. This allows him to keep the same cards stored away if he chooses. Dong Cheng's Imperial Jades cannot be targeted with Steal, Break, or any cards or abilities.